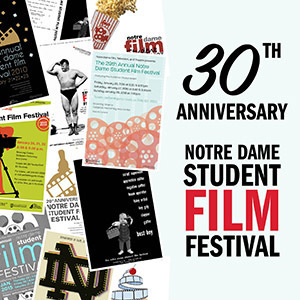 An annual launching pad for student filmmakers as they begin their careers in the film, television, and entertainment industries, the Notre Dame Student Film Festival screens films that were made by undergraduate students during the past year as class projects in the Department of Film, Television, and Theatre. As in recent years,audience members are invited to vote for their favorite film via text message. The Audience Choice Award will be presented to the student directors of the winning film after the final screening. The only hope for a million stray cats and dogs in Texas may be one woman…and her camera. Making the transition to college might be a challenge, but transitioning in college is definitely daunting. A scientist searches for the solution to save her town frozen in time. Thousands of miles from home, international students find a mother figure in a dining hall worker from Vietnam. A symphony of brush strokes paints the tale of a boy lost in the canvas. Stranded on a country road? Welcome to the farmhouse over yonder. Some home security systems are better than others. A hypnotic journey into a memory lost. It’s a tall task on election day at the Office of Voter Registration. A retired thoroughbred horse in the Bluegrass state still has a life to live. TICKETS: May be purchased online, by phone at 574-631-2800, or in person at the DeBartolo Performing Arts Center ticket office (M-F, 12:00 – 6:00 pm). *Audience Choice Award will be presented after the 7:00 pm screening on Sunday, January 27. Running Time: Approximately 120 min. Some films may contain mature content.